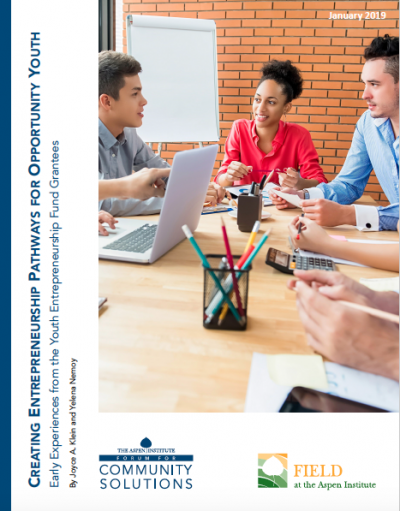 In our new report, co-written with FIELD at the Aspen Institute, we examine the potential for using Youth Entrepreneurship Fund (YEF) programs to engage and create pathways for opportunity youth by exploring results from Opportunity Youth Forum communities that received YEF grants and have entrepreneurship initiatives now in progress. The YEF seeks to promote racial and economic equity by ensuring that youth experiencing barriers to participation in the economy – including youth of color, Native American, and rural youth, as well as youth who are low-income and reside in public housing – are provided with a full range of opportunities to develop an entrepreneurial mindset and skills that can help them thrive in today’s economy, as well as access to tools and resources needed by aspiring entrepreneurs. The YEF seeks to promote racial and economic equity by ensuring that youth experiencing barriers to participation in the economy are provided with a full range of opportunities to develop an entrepreneurial mindset and skills that can help them thrive in today’s economy, as well as access to tools and resources needed by aspiring entrepreneurs.